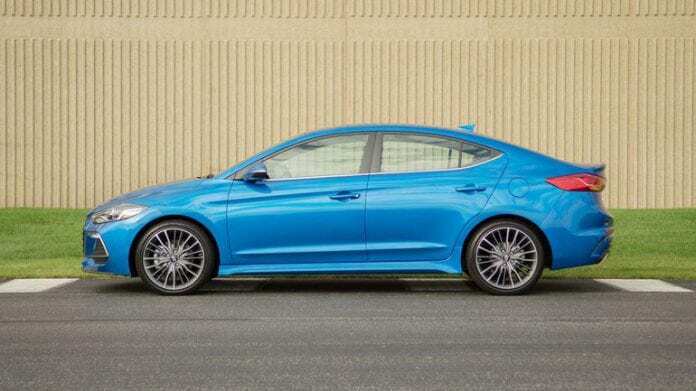 The 2017 Hyundai Elantra Sport boasts a more powerful turbocharged engine, a performance suspension, bold exterior styling and unique interior features. Boost your driving experience to a higher level with the Elantra Sport. The turbo engine makes it go. The 6-speed manual or 7-speed Dual Clutch Transmission keeps it in the powerband. And the sport-tuned suspension featuring a multi-link rear setup and steering keep it stuck to the road. While the 4-wheel disc brakes with larger front brakes will haul it all to a stop. How can your driving experience not be an experience when you’ve got this kind of power under the hood? Dial in the supportive sport front seats. Take hold of the substantial flat-bottom leather-wrapped sport steering wheel and get ready for fun. The black headliner and aluminum alloy pedals are stunning. The carbon-fiber-look trim and the sport instrument gauge cluster add detail and style. If you’re a confident driver, that’s good because the Elantra Sport is confident in its good looks too. The 18-inch alloy wheels grab plenty of attention and asphalt. Every angle gets the performance touch including a sport front grille and bumper fascia, standard HID headlights and LED Daytime Running Lights. Going away, there’s more to see: chrome twin-tip exhaust outlets, sport rear fascia with diffuser and LED taillights. All tied together with sport side sill extensions and side mirrors with turn-signal indicators.